Twitter traffic is up 700 percent over last year, and it's all thanks to the old-timers. That's according to the latest numbers from ComScore, which says Twitter drew almost 10 million visitors worldwide in February 2009. 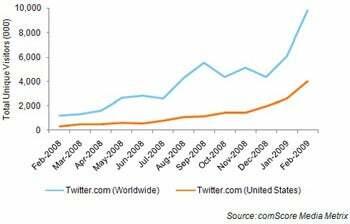 In the past two months alone, Twitter traffic has grown by 5 million worldwide visitors, while U.S. Twitter traffic accounted for 4 million visitors in February 2009--a 1000 percent jump over last year. 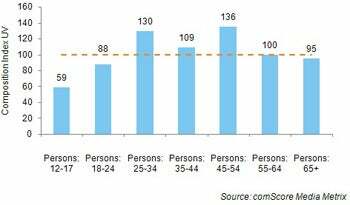 What surprised the folks at ComScore was that the average age for Tweeters was in the 25- to 54-year-old range, with the over-45 set stealing the bulk of the user pie. ComScore says people aged 45-54 are 36 percent more likely to use Twitter than the rest of us, while those aged 25-34 are 30 percent more likely. True to their slacker upbringing, Generation Xers aged 35-44 come in third and are only 9 percent more likely to use Twitter than everyone else. The numbers are not that surprising when you consider that many businesses are turning toward Twitter for public relations, brand management and even customer service. Add to that the non-stop parade of "Internet entrepreneurs" and self-appointed "social media evangelists" and ComScore's results start to make more sense. ComScore blogger Sarah Radwanick says the latest Twitter results also point to the aging of the first generation of Internet users. As these users grow up, they remain just as curious about emerging technologies and services. This means the concept of the technologically inclined "early adopter" as a young, predominately male demographic may have to be revisited. Taking that one step further, perhaps as generations who grew up knowing some form of computer -- be it an Apple II, Commodore 64, IBM compatible or Windows XP machine -- spread across all age ranges, a person's age may not be a big factor when looking at future technologies at all. The The Pew Internet and American Life Project in February released similar results to ComScore's, which said the median age of Twitter users was 31. One thing's for sure: Twitter's growth shows no signs of slowing with everyone from casual users to celebrities jumping into the Twittosphere. ComScore's official numbers for March are due out later this week, and Radwanick says it's going to be another huge month for the microblogging service. Follow Ian Paul on Twitter @ianpaul.